Even though I’m back to being a Jozi girl, one thing I’ve learnt from being a former Durban blogger, is how to travel smarter. I used to travel all the time (to Jozi and CT) for overnight launches and I eventually created a little on the go beauty bag. A bag that’s always packed and ready to go, with some essential travel beauty products. Since we’re heading into holiday season, I thought I’d share the contents of my travel beauty bag to give you gals some tips and advice on what I can’t travel without. 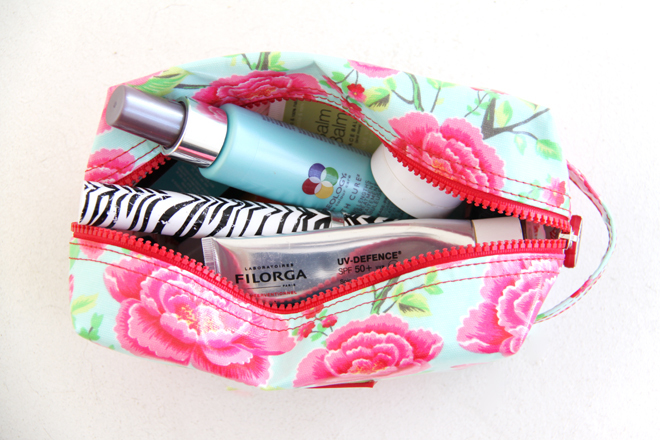 This little Lou Harvey toiletry bag is the perfect travel size toiletry bag and holds a ton of products. In the past I had different toiletry bags, from ones with built in hangers (so you can hang it on a bathroom rail in your hotel room) to many, many others. I love this one because, when it’s unzipped, you can see and grab anything… no having to empty the contents of your entire bag every time you want to find something. And I mean it’s cute too so who can argue with that?! 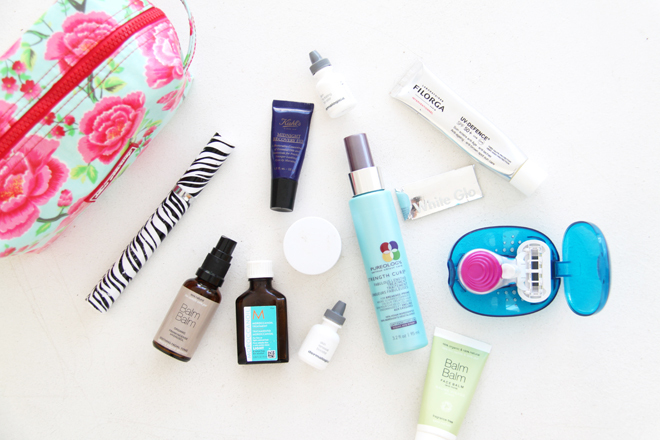 These are products that live permanently in my travel beauty bag. When I travel, I often add a few other things to the mix, like shampoo, conditioner, body cream, deo and some essential (mostly) skincare products that I’m using or needing at the time, but these are the cant-do-without essentials, and even if, lets say I happened to forget the other additions, I could survive on these. My Slimsonic Toothbrush (which, as you can see, I’ve had for ages) permanently lives in my travel beauty bag. It’s a cute little electric toothbrush that comes with a cap, so you can close it up and not risk your toothbrush gelliging with other wierd and wonderful beauty product spillage. Kiehl’s Midnight Recovery Eye Cream is a fantastic “Travelling” eye cream, because usually when I travel I reach my destination exhausted, and with that, puffy, dull eyes. I like to keep this little guy on hand to help me out while I’m travelling and so far, it’s been a godsend! Balm Balm Frankincense Toner is a great skin calmer and hydration booster spray. It gives my skin a nice cooling, calming effect, which is usually much welcomed after a flight or even road trip, and it doesn’t’ irritate my skin when climates change. Moroccanoil Light in this cute and compact travel size bottle. Because, well I love Moroccanoil and it makes such a huge difference to managing my hair. Depending on where I’m travelling to my hair almost always feels the change in climate, so I like to be prepared for good hair days ahead. That plain white tub is just a Hair Mask. I usually scoop out what ever mask I have in my shower and fill up this little tub with it so that I can take some with me. I do try to pack shampoo and conditioner as well – and the amount will depend on how long I’m travelling for, but a hair mask is always, always needed! Dermalogica Hydrating Skin Booster and Dermalogica Skin Renewal Booster are both perfect little travel sized bottles of awesome! Since you can’t always determine the climate of where you are travelling, it’s always good to be prepared, and I mean for anything! So instead of lugging around a big bottles of treatment products “just in case”, these little 10ml bottles are ideal. They are highly concentrated, so you just add a drop or two into your moisturiser and in an instant, you have a customized skincare treatment suited to your skins needs. Pureology Strength Care Fabulous Lengths Treatment. I only just got this product, but it’s so amazing, I need to get a second one just for my on the go beauty bag as well! It keeps my hair so incredibly manageable, smooth and soft, I literally can’t live without it! Plus it helps to strengthen the hair as well so it can grow, grow, grow! White Gloss Floss Sticks because you always need dental floss and these are great. You can even pack them into your handbag. In fact, I actually carry a pack in my handbag too! Filorga UV Defence SPF 50 because I never go without sun protection! Balm Balm Face Balm. I usually pack in what ever moisturizer I’m currently using, but I keep this one on hand as a “spare” in case I forget moisturizer. It’s fragrance free, so perfect even if my skin is feeling a little irritated when I travel, plus it can be used to soothe dry lips, hands, neck, arms…. errything! It’s thick and concentrated and because it’s a balm a little goes a long way. It’s a miniature Gillette Venus Razor that’s super tiny, without compromising on the blade (as it uses the exact same 5-blade as the regular razor), plus it comes in a cute, breathable container – so no nicked fingers. The pretty pink circle adds more than just appeal to this little gem, with an easy to control, grip handle so you can shave easily! PS: To launch this cute little thang thats only R74.99 (at leading retailers), Gillette Venus are running a fab competition, where you could win a R20 000 Topshop shopping spree! All you have to do is snap your Venus Snap and the contents of your bag on social media. Details and all the necessary hashtags can be found on the pack, so get one NOW!